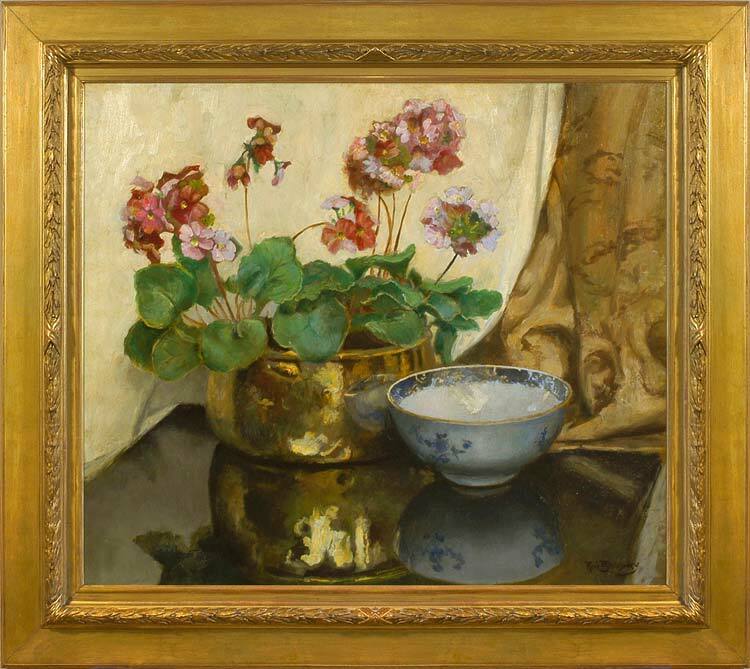 This seductive and softly coloured composition, with its painterly study of geraniums planted in a large brass preserving pan, is at first sight merely a charming and harmonious still life. Examined more closely, however, and it can be seen that the artist has achieved a complex and difficult intellectual exercise, comparable with Monet’s waterlily paintings, in which he has attempted to represent in two dimensions three-dimensional objects, their shadows on the flat supporting surface, and their reflections within that highly polished surface. These relationships are further complicated by the differently reflective natures of the porcelain and the brass, and by the subtle colour harmony of the picture surface. Robert L.P. Boudry (1878-1961) was born in Ypres, and seems to have worked mainly in and around Antwerp. He produced still life and landscape paintings, and also very accomplished etchings. The landscapes are steeped in sunshine and manufactured of pure colour, so that although they are realistic views, portraying local agriculture and coastal industries, they also tend toward the expressionistic and symbolic and teeter on the brink of Fauvism.